The photo above shows what my rose bush will look like this summer. I remember when my FIL handed me a little plant in a McDonalds paper cup. 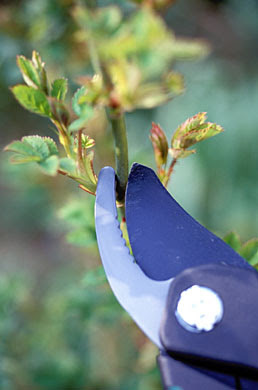 He explained to me that he had made a cutting from a rose bush and nutured it into the tiny plant that it now was. I remember thinking at the time that it probably wouldn't survive but put it in the ground anyway. Five years later, it's trying desperately to get out of the fence. Right now the rose bush is sprouting it's new leaves and a few days ago I undertook the challenge of pruning all of the dead wood away. It took me quite some time. I also decided to move four other rose bushes and pruned them down to barely a foot so I could move them more easily. Needless to say, when all was said and done, I was bloodied and scratched but the four are thriving in their new spots and the red rose above is greening out and will have it's best showing to date. 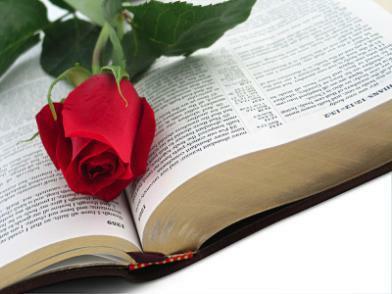 I was studying God's Word this morning and looking out the window at the rose bush. I was feeling very convicted by some of the things I was reading. I began to think of the similarities between the pruning of roses and God's pruning of us. Just as I cut the dead wood away so that the rose can grow stronger, become fuller and reach it's potential, God does the same for me. His Word reveals areas where I need pruning in my life, my thoughts, and my actions. He pricks my concsious with areas that need the dead wood taken away so that I can become stronger in Him, fuller and reach the potential that He intended for me. It's not easy and sometimes it hurts, but in the end if I can blossom like that rose bush for Him, it is all worth it. Awesome post/example. Oh how He loves us! I seriously need to borrow those pruners! Beautiful post. Lovely roses, lovely thoughts. I've been convicted about needing to change some things in my life/heart lately, too. Isn't God gracious and merciful to continue to work in us the image of His Son?! That is such a good "object lesson"! Well said! roses are a lot of work, but oh, the glory! Beautiful rose bush. I haven't had much success with propogating rose clippings, maybe I should try again! God is awesome and always knows just where to prune us for maximum bloom! I love your posts, Renee, they truly come from the soul of a poet that God has put within you. You are a blessing to us and I thank God for you.